Sexes alike. Blackish-brown plumage, feathers edged paler; almost white head and neck; black cap; dark, broad eye-stripe; green speculum bordered above with white; black bill tipped yellow; coral-red legs and feet. Pairs or small parties walk on marshy land and wet cultivation, or up-end in shallow water; usually does not associate with other ducks; when injured, can dive and remain underwater, holding on to submerged vegetation with only bill exposed. reed- and vegetation-covered jheels, shallow ponds. wild grain, seeds, shoots of aquatic plants; occasionally water insects, worms, water-snails; causes damage to paddy. resident; N subcontinent, up to about 1,800m in Kashmir; local migrant in some areas. The Indian Spot-billed Duck is the commonest and most widespread of the few duck species that breed in our area. It is a resident species with no evidence of movement, except in dry periods when it may have to move around to find sufficient water. It occurs wherever there is water, favouring large wetlands and small ponds alike, and feeding mainly on aquatic vegetation and animals from or just below the water surface. It breeds from March to June, sometimes raising two broods, and broods of up to 15 fluffy ducklings can be seen from April onwards. Like all ducks they can swim, dive and feed immediately after hatching. Breeding usually takes place in thick reeds and other waterside vegetation. Although common, flocks are usually relatively small with 50 to 200 being the normal maxima. 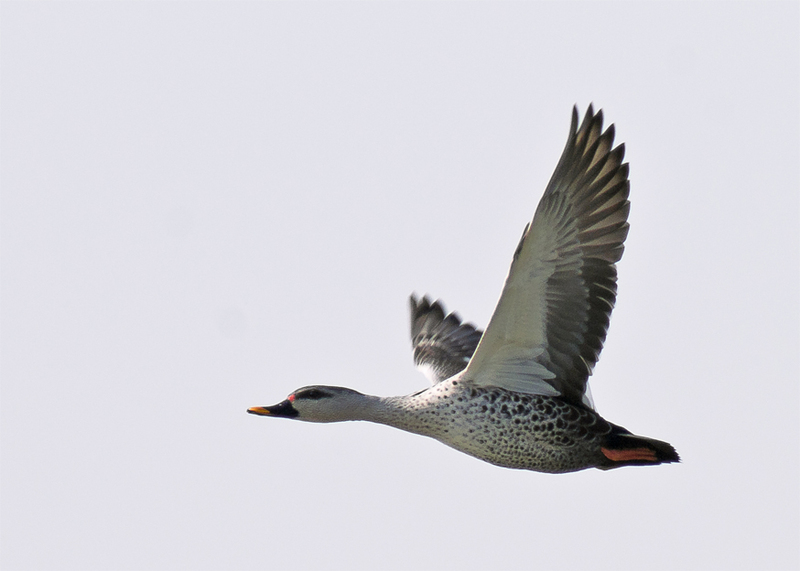 These large flocks are typically seen at the beginning of the breeding season in March and when the young are flying from May into the autumn. Obviously, much smaller numbers are seen on smaller water bodies. They tend to form single species flocks but often on the edge of larger flocks of wintering dabbling ducks. They make short flights in small parties and in March and April males will gather to harass and try to mate with any lone female that is not already nesting.